Bamboo butcher block top are certainly an unusual choice. However if you realize the benefits of bamboo butcher block top then you will instantly want to change your existing one. First aspect is that bamboo butcher block top are very economic in comparison to other materials. Especially if you compare per square foot price of quartz, stone and marble then bamboo butcher block top certainly score points. 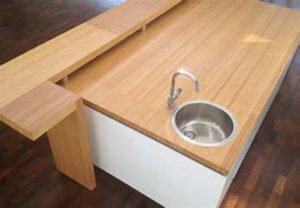 Furthermore, the cost varies with bamboo butcher block top’s thickness, length/width and finish, which offers you maximum chance of adjusting your budget. Using eco-friendly and sustainable materials is definitely the need and requirement of present times. 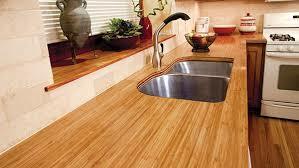 Therefore if preserving the environment is your priority in butcher block top then bamboo is the best option. The degree of strength and durability of bamboo butcher block top is higher if the material is treated correctly. If it is treated with a good sealer than you can easily maintain its appearance and strength for a longer duration. However, avoid using bamboo butcher block top as a cutting board or for placing hot pots too frequently to prevent cuts and burns. A variety of sealers are available in the market for finishing bamboo butcher block top. Mineral oil and Tung oil instead of traditional varnishes are preferred for sealing bamboo. This is also suitable for counters where food is prepared. These oils make the bamboo butcher block top water resistant and food-safe, which is a quality not present in other butcher block top sealed with varnish.